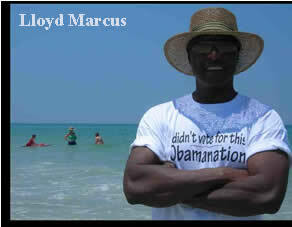 Lloyd Marcus -- He's Obama! He's Black! 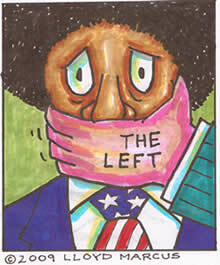 So, Shut Up! I just flew back home to Florida from LA. I was out there shooting an episode of the Right Network new TV show, “Politics & Poker”. I had a ball! The host of the show is Thomas F. Wilson, who played Biff Tannen in the “Back To The Future” movies. Beach bathers kept staring at us. Most smiling. A few stone faced. Then, it dawned on me. I was wearing my, “I didn't vote for this Obamanation” t-shirt. We fed “Cheetos” to the seagulls. What a great relaxing day. Life is good.